Indipendent villa with 18+2 sleeps. The villa is divided into six independent units, each one with its own kitchen corner, but at the same time is endowed with a very large and fresh living-dining room with sitting area and kitchen placed on basement floor, where the big groups can easily stay together. So it is particularly suitable for several families who can spend their vacation together still maintaining their own privacy and autonomy. At clients' disposal Wi-Fi access, Satellite TV and air conditioning. Furnishing is simple and functional and guarantee a good level of comfort. The villa has a nice, completely fenced and well-kept garden, covered car spots, table tennis, mountain bikes and a beautiful swimming pool with gazebo and pergola equipped for outdoor meals. Swimming pool (size 6x12 m, depth 1,20-1,50 m.), Gazebo, pergola, outdoor chairs and table, fridge with freezer (7), freezer, dishwasher (5), oven, washing machine, machine American coffee maker, moka, espresso, toaster, satellite TV, Wi-Fi Internet connection, microwave, high chair for children, children's box, electric oven, kettle (2), fans (2), table tennis, mountain bikes, Nintendo console Wii, barbecue, mosquito nets on the windows, air conditioning. Pet allowed. Included in the price: Pets allowed. Electricity, hot and cold water.Wi-Fi Internet access. Private pool open from 04/05 to 28/09. Property cleaned and supplied with bed linen and bathroom towels with weekly change. One baby bed (for children up to 3 years) on request at time of booking. Not included in the price: Breakage deposit Euro 600 (payable in cash on your arrival and held by the owner for the duration of your stay). Air conditioning Euro 30 per day (if used). Obligatory final cleaning Euro 300. Heating Euro 30 per day (if used). Wood Euro 15 each 100 kg (if used). 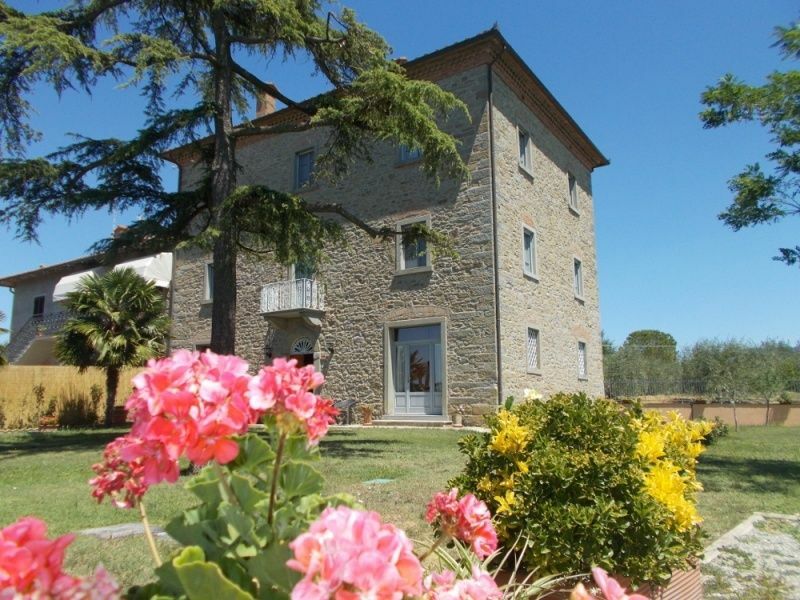 This is a beautiful 9 bedroom property located in Tuscany, Italy. This villa, in Fratta-Santa Caterina, is a comfortable property sleeping 18 people. The property has 9 bathrooms. The villa offers superb accommodation, including modern luxuries such as a swimming pool and internet access. You can easily kick back and relax, making use of its tennis court. The villa has disabled access.